Savannah Baroque will make its debut at the Unitarian Universalist Church of Savannah’s 2017-2018 Concert Series on Nov. 12, 2017. The artists include: myself on harpsichord; Ann Cafferty, baroque violin; Jeana Melilli, traverso; Marcy Brenner, viola da gamba; Tina Zenker Williams, soprano; Kyle Siddons, baritone. We will be playing diverse music by three great composers born in 1685, J.S. Bach, Handel, and Domenico Scarlatti, and featuring music from Handel’s Ode to St. Cecilia, the patron saint of music, in honor of her name day on Nov. 22. On Nov.9 at 10 in the morning, Eric Caines, baroque oboe and myself will appear on WTOC’s Live in the Morning show to talk about Savannah Baroque and our upcoming concert on Nov. 12 at the Unitarian Universalist Church of Savannah. We plan to make a little live music too. Wish us luck! 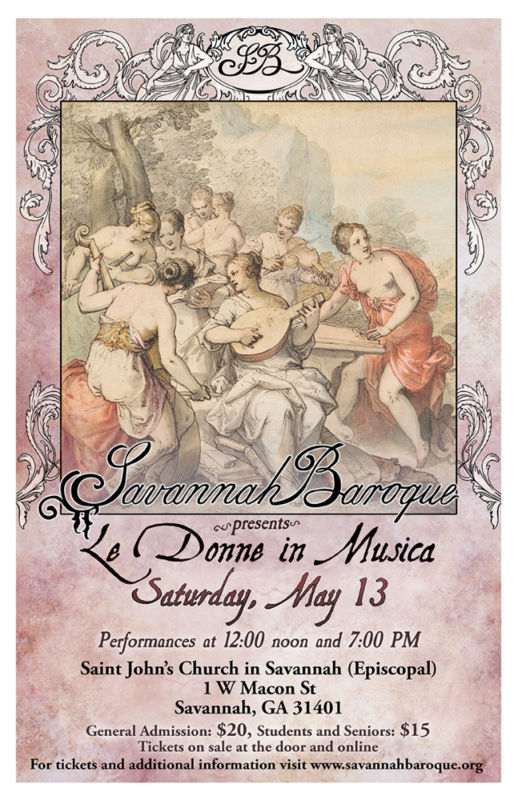 I am delighted to announce a performance of my group, Savannah Baroque, in “Le Donne in Musica”, a program about and by women of music, with sopranos Tina Zenker Williams and Ashley Roper, baroque violinist Ann Cafferty, baroque flute Jeana Melilli and gambist Marcy Jean Brenner. I, of course, play the harpsichord. Two performances: 12 noon and 7 p.m.
Acker, Anne. “Electronic and Computer Music Instruments.” In Oxford Bibliographies in Music. Ed. Bruce Gustafson. New York: Oxford University Press, 2017. I am delighted to announce a performance of my group, Savannah Baroque, in “Love and Passion”, a program of music about love lost, love won, the joys and sorrows of the passions: with sopranos Tina Zenker Williams and Ashley Roper, baroque violinist Ann Cafferty, baroque flute Jeana Melilli and gambist Marcy Jean Brenner. I, of course, play the harpsichord. Dec. 15, 5 pm. The Goliards provides music for Advent for the evening service at St. John’s in Savannah (Episcopal), 1 W. Macon St., Savannah, GA 31401. For this performance I play sinfonye and organ, along with John Hillenbrand, vielle and Cuffy Sullivan, voice. I am delighted to be playing piano (as the orchestra) for two performances of Amahl and the Night Visitors by Gian Carlo Menotti, performing along with some marvelous guest artists including Roger Moss and Rebecca Flaherty and the ‘shepherds’ from the Garrison School for the Arts, Savannah, Georgia. Dec. 9, 10, 7 p.m.